Thrilled by the news that a new animation studio is opening up in Montreal (a side-effect, I think, of the low dollar making it more tempting for foreign operations to invest here. Not to mention the high number of talented artistic types in this city). 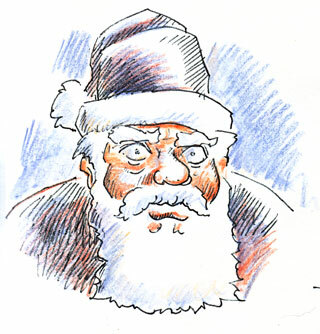 In honour of that fact, I’ve done this amazing, highly-detailed portrait of Santa Claus, the star of their first announced project.